In 2005, the aviation world’s eyes lit up with excitement when the first Airbus A380 took into the skies over Toulouse, France. 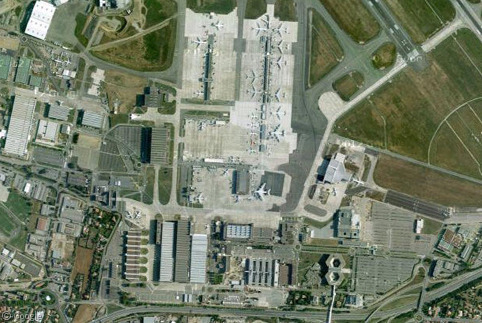 It was the initial flight of the world’s largest airliner, and it happened at Aéroport Toulouse-Blagnac. Airbus does not just make A380’s here however, it’s also the birthplace of many other Airbus aircraft. Thanks to some new high-resolution imagery (including 45 degree views) we are now able to take a detailed look into one of the largest aircraft production facilities in the world. Each Airbus A380 is actually built in large sections across Europe, then shipped to Toulouse for final assembly. 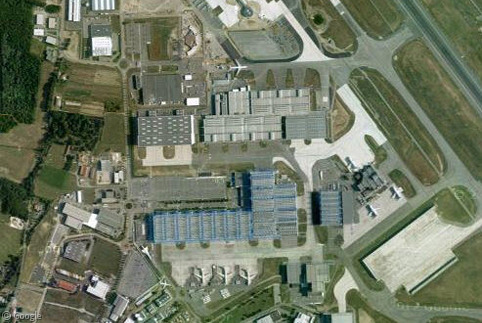 The Jean-Luc Lagardère Plant located on the north side of the airfield is where the aircraft finally comes together. 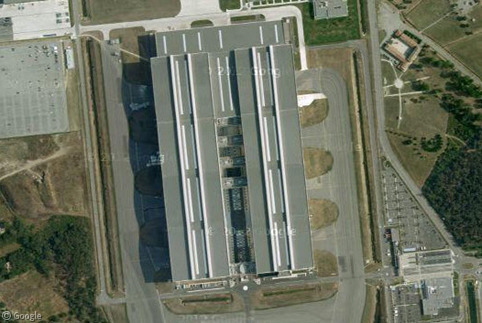 This massive building can hold up to six Airbus A380s at the same time! The Airbus A380 is so big that it has a unique designation when communicating with air traffic controllers. Most large airliners, such as the Boeing 747 or Boeing 777, always say the word “heavy” when identifying themselves. This is so controllers are reminded that they are not as nimble as their smaller cousins. The Airbus A380 however, uses the word “Super” in the same context! A view from the street view car gives us an idea of how super this building needs to be to house the construction of these huge machines. 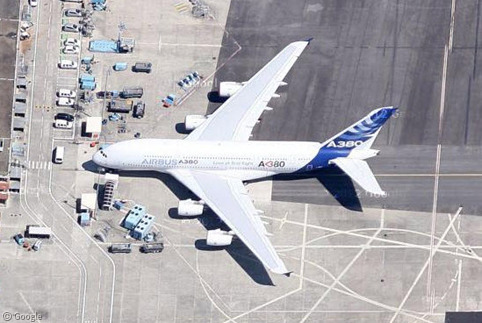 Immediately outside, to the south of the assembly plant, we find a freshly built Airbus A380 sitting on the tarmac. Zooming in to the 45 degree view however, and suddenly we find six brand new super jumbo jets. The tails are already painted, so we can easily identify the customers for each new aircraft. Rotating clockwise from top left we find Thai Airways, Emirates, Korean Air, Emirates again, an unmarked airplane (assuming Airbus), then a third Emirates. 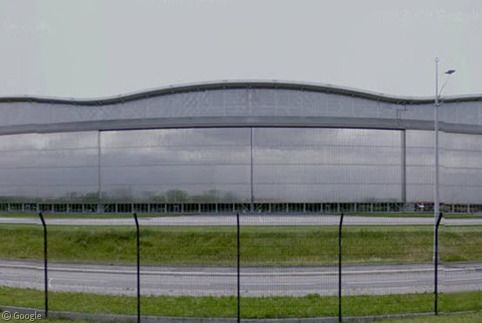 Moving over to the southwest side of the airfield, we find the main Airbus headquarters and manufacturing facility. On the ramp we find a large selection of brand new Airbus A320s, A340s, and even one A380. Zooming in we can identify some of the operators again. 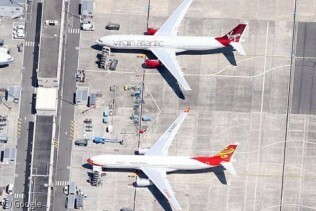 In this picture we have two brand new Airbus A330’s for Virgin Atlantic and Hainan Airlines. The single Airbus A380 located on the south ramp is used by Airbus for testing purposes. 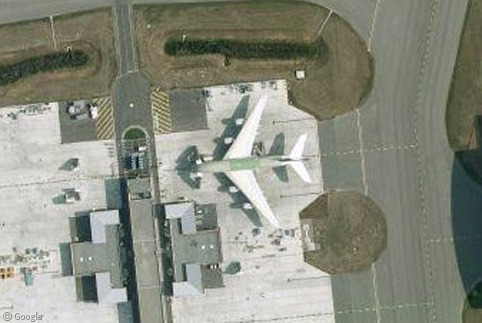 You can clearly make out the phrase “Love at first flight” thanks to Google’s detailed 45 imagery. Moving west at the airfield, we find the manufacturing buildings for the first commercially viable fly-by-wire airliner, the Airbus A320, as well as the Airbus A330/A340 series. Further north we find the home of the Airbus Beluga, an aircraft specifically built by Airbus to carry some of it’s own aircraft parts to build other airplanes. It’s also used to carry oversize or awkward cargo to and from the airport. It looks like a fresh shipment of aircraft parts (more like aircraft sections) has just arrived! 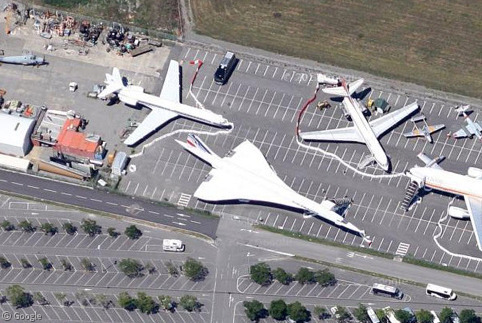 Strangely enough, scattered around the airport we find a small collection of Concordes (The supersonic passenger jets were retired in 2003, and we’ve been hunting them on Google Sightseeing for years!). There’s one sitting outside the A330/A340 assembly plant, and another sitting north of the A320 assembly line. The Ailes Anciennes Toulouse (The Ancient Aircraft collection) is an association dedicated to the salvage, conservation and restoration of aircraft. 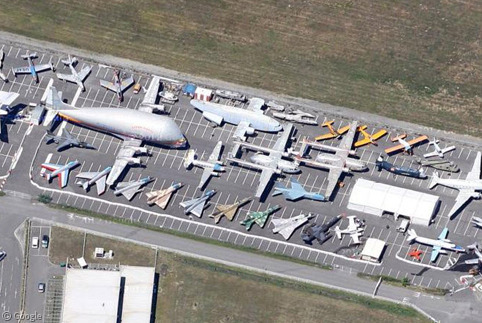 They have an incredible aircraft collection at the airport that is visible from satellite view. 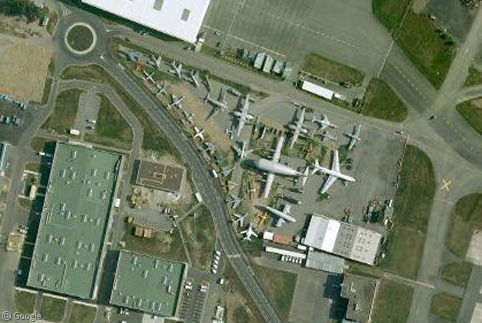 Zooming into 45 degree view however reveals another change, because the collection was moved recently to allow expansion of the Airbus facilities. The new collection is located south of the airfield in what used to be a car park. 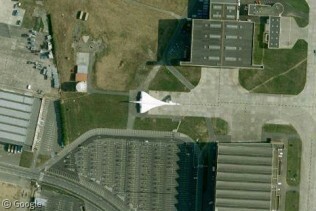 And look, there’s another Concorde there too. 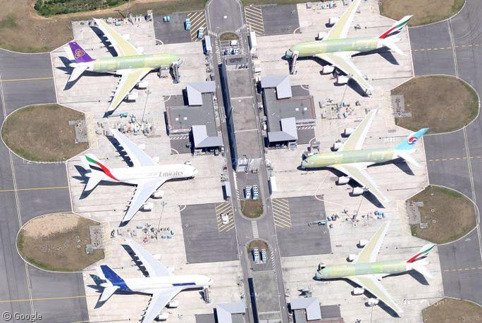 If you’re an airplane buff, you owe it to yourself to take a look around this huge Airbus facility. There are aircraft all over the place, and pieces of aircraft scattered everywhere in between. 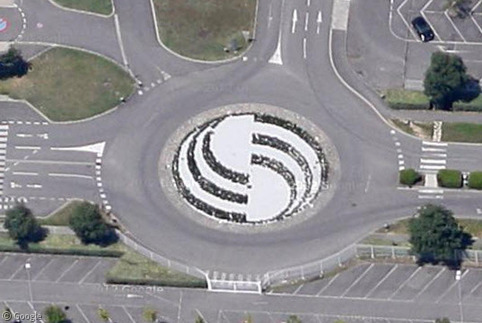 We even found the Airbus logo in the center of a roundabout! I don’t think you have been misled at all! 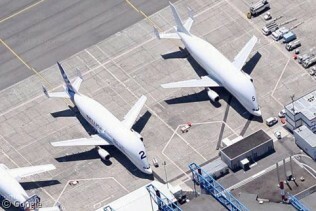 Most aircraft are built in two “phases” before delivery. The “initial phase” consists of building the aircraft itself (which for the A380 appears to be done in Toulouse), and the “final phase” is where they add seats, headliners, floors, etc to the airplane. Many manufacturers have multiple locations for the outfitting. And yes, you correctly spotted another A380 on the ramp in Hamburg! If you zoom in far enough you can actually see A380 on the side! I wasn’t doubting your excellent article about the assembly in Toulouse (which was also mentioned in the Mighty Planes episode) … I just wanted to get Airbus in Hamburg a mention 😉 But I did just spot this fascinating structure … which I can only assume is some kind of engine test stand. Which is kind of weird seeing as the A380s are flown to Hamburg … and you would think they’d test their engines BEFORE the first take off. Whatever that is Tammo, it is ENORMOUS. Ok, so after posting my comment I discovered the button. duh.